When it comes to great food you need great ingredients. Restaurants wax lyrical about the provenance of their beef – rare breeds, lovingly raised and hugged to death before being aged in Himalayan salt caves by Benedictine monks. But how much attention do they pay to the fish? In contrast to the pre-historic beef it needs to be incredibly fresh and sustainably sourced. That means you need a fishmonger – when Hawksmoor opened their Air Street restaurant they turned to the best in the business – Mitch Tonks. Mitch works with fisherman from Brixham and serves their produce at a range of restaurants, including Rockfish Grill in Bristol. In the delightfully upmarket Clifton area it’s a smart neighbourhood restaurant with a wonderfully fishy edge. The menu changes daily and their wine list is designed to match and very reasonably priced to boot. In the kitchen the eminently trendy charcoal Josper oven takes pride of place – searing the fish at incredible temperatures while keeping the middle wonderfully moist. To start I had some lovely queenie scallops, simply grilled with a garlic and breadcrumb topping. Tender, juicy and very moreish. The main course was a huge piece of monkfish, fresh from the charcoal oven. Served with a simple salad it was beautifully seasoned and perfectly cooked. I can’t remember the last time I had fish this good. Excellent chips and some very nice samphire provided the perfect sides. Dessert was an easy choice – Cointreau doughnuts with a hot chocolate sauce. The doughnuts were freshly fried and full of raisins and pine-nuts, the hot chocolate sauce nicely balanced with a subtle alcoholic kick. All washed down with a carafe of Albarino it was a wonderful evening. With ingredients this simple there’s nowhere to hide, and with fish this good it’s a crime to mess it up. Rockfish served a pretty faultless meal and I can’t wait to go again. Sometimes food bloggers can be utterly infuriating – there’s a huge buzz about celeb hotspot Chiltern Firehouse at the moment, which means mere mortals won’t get a table this decade. Thousands of words have been written about an experience that you can’t go out any copy, and I’m about to do the same. Not about some A-list mecca, but about a beer. If you’ve followed my blog for a while, you’ll be familiar with my penchant for homebrewing. I’ve recently started taking it more seriously and am loving the ability to customise my brews – I can indulge my passion for vast piles of hops. One of the standard bearers of the British craft brewing movement, Brewdog, share this philosophy and their own beers and bars are a temple to the humble hop. They’ve also made friends with lots of other brewers around the world which gives them access to some stunning beers. 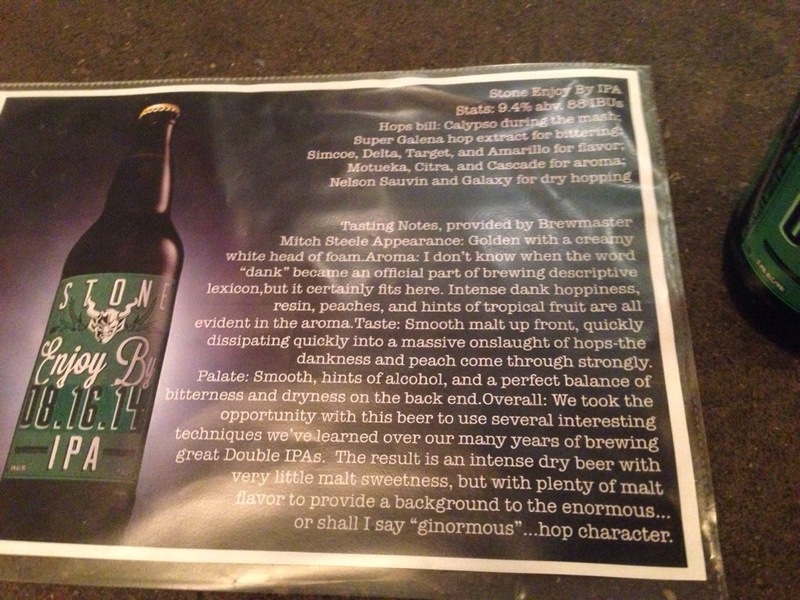 There was a lot of excitement on Twitter when they announced their latest guest beer – “Stone Enjoy By 08.16.14”. Stone Brewing Co are a really exciting brewery from San Diego and their output is pretty rare in the UK. The date in the name is no accident, this is a special beer brewed specifically to have a short shelf-life. It has over ten different hops used at various points in the process and the result is mindblowing. It’s got a wonderful mouthfeel – silky, light and very smooth. There’s a delicate sweet malt backbone, but the real stars are the hops. There’s a huge amount of tropical fruit – mango, pineapple and passionfruit, backed up by strong citrus and some subtler piney notes. Despite being 9.4%ABV it doesn’t taste anything like that strong. It’s so easy to drink and in the sweltering London heat, wonderfully refreshing. It’s damn near the perfect beer, and certainly the best I’ve ever tried. Restaurants are incredibly subjective – one persons gastronomic delight is anothers culinary car crash. Michelin is the gold standard, the World’s 50 Best is highly respected and the Good Food Guide is normally reliable. The latest to be updated is Restaurant magazine’s ‘Top 100 UK Restaurants’, I happily scanned through, agreeing with many of the choices until I got right to the top – Gymkhana?! 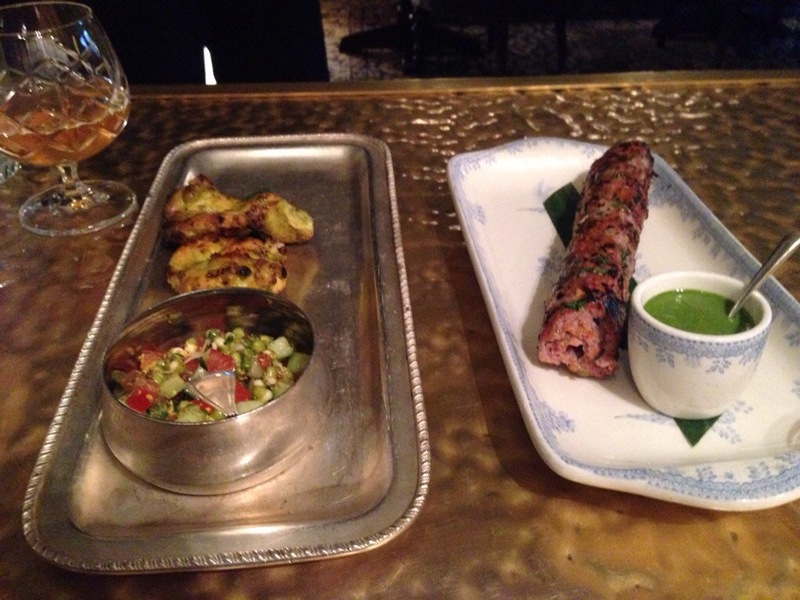 An upmarket Indian which is the cheaper off-spring of Trishna? Aware that it would be inundated with desperate foodies (like myself) I quickly snagged a lunchtime reservation and went to see what the fuss is all about. A quick stroll from Green Park tube, it’s as central as central gets. The smart exterior gives way to a lovely, thoughtfully designed interior. It’s supposed to evoke the victorian sporting clubs of India and it does a remarkably good job. There’s taxidermy on the walls, framed shooting manuals and Punch prints – infinitely better than the usual Indian chintz. The menu is extensive and there are several set options available – in the interests of having as many of their greatest hits as possible we went with their six course taster, a snip at £55. While we waited for our starters some gorgeous poppadums arrived in three miniature varieties. The mango chutney was lovely and I particularly liked the thick chilli sauce. It set the scene for the whole meal – this is Indian, but done with a style, flair and precision that you’ve never seen before. The first proper course was very nice – a whole blend of textures, deftly spiced and served with a cooling yoghurt. Simple ingredients but cooked in three or four different ways – a very promising start. I normally avoid seafood at Indian restaurants on principle – it’s almost universally a disaster. Thankfully these are the exceptions that prove my rule, truly enormous prawns, perfecly cooked and with a heavenly sauce – silky smooth and with a delicate heat. Gymkhana have a whole section of their menu dedicated to game and this was our first taste. Banish all thoughts of the dry, non-descript kebabs found in your local tandoori. This was rich, tender and very juicy. The flavour of the bird blending effortlessly with spice and nicely hot chutney. The chicken was equally good, very moist and with a nice char. The kachumber relish added some clever crunch and sharpness. Minced goat with buns – this deceptively simple take on a popular streetfood was heavenly – especially with the addition of creamy gelatinous brains. Feed your inner zombie! Finally we arrive at the main course! The vindaloo is nothing like the macho spice off you might expect, it harks back to the original dish with it’s strong Portuguese influence and sharp vinegary tang. The pork was wonderfully tender and sweet. The Jheenga curry is another southern delicacy, stuffed full of prawns and expertly spiced. The sides were equally good – a lovely dal, beautiful little potatoes and some really good naans and parathas. The only slightly bum note of the meal were the desserts – it’s not an Indian strongpoint and both left me slightly underwhelmed. The saffron ice cream and jelly was nice, but there was a little too much cardamom and the like to really make it work for me. The Kheer is a kind of cold rice-pudding, nice in a way, but more a breakfast item than a proper pudding. Some simple fruit sorbets would have been a much nicer way to finish! After a coffee two little chocolate starwberry crunches finished the meal – a nice touch. The desserts aside – it’s a real masterclass. It’s authentic, traditional Indian food expertly cooked with great ingredients. There’s so much passion, precision and enthusiasm in every plate that you can’t help smile. I’m not sure if it’s the best restaurant in the UK, but it’s a really wonderful experience and one that ends up being uniquely English. Magnificent – just head somewhere else for pudding! Plenty of people (including myself) have been touting Tooting as South London’s next gem. What was once an unbroken chain of dodgy asian restaurants and betting shops is being revitalised as a foodie hotspot: Chicken Shop, Meza, Chez Vous, The Little Bar, Kennedy’s – there’s a lot to love. The latest (and very welcome) addition is Honest Burgers. I’ve visited their Brixton outfit before – how does Tooting compare? The interior is what you’d expect from a upmarket fast food mecca – exposed brickwork, bare wood and vintage stools. It’s got cow horns on the wall and a hipster bike. There’s a definite buzz to the place, friendly servers whisking food around the packed tables and a string of bemused locals peering through the windows. The menu is wonderfully simple, a handful of options with the right sides and an excellent craft beer selection. They win bonus points for serving the very local ‘Wolfie Smith’ from “By The Horns” – you can chuck a rock at the brewery. With food this simple there’s no room to hide – and it is very good. The bun has the resilience and firm crust of a brioche roll without the overpowering richness. The patty itself is quite finely ground, but cooked to a nice medium. It’s not as juicy as the likes of Patty and Bun or MEATMarket, but considerably tastier than the likes of Byron or ShakeShack. It’s rich and meaty without being overpowering. In terms of extras – I opted for the Tour de France special (with aged comte, alsace bacon, red onion relish, sauce gribiche and a side of bearnaise). Each ingredient was well thought out, carefully cooked and the whole made a mighty impressive burger. Almost as important as the burger are the chips – here they’re nicely rustic rosemary fries. Well salted and with a good hint of herb, they don’t really need condiments. Crisp without being unpleasantly crunchy – they’re a great chip. Scrabbling around the parchment paper for the scraps at the end is half the fun. And that’s it! There’s no desserts menu – it’s as simple and honest an experience as the name suggests. It’s one of the best burgers in London, the staff are wonderful and the decor is lovely – this one’s a keeper. Now all Tooting needs is a quality pizza joint – can we tempt Pizza Pilgrims south!? When people ask me where to go for an Indian, my normal response is anywhere that isn’t on Brick Lane. Tooting has some fantastic options and I’ve been happily eating my way round them (Lahore Karahi, Dosa and Chutney and Maseledar all deserve a visit) over the last year. When I spotted barbecue god Neil Rankin mentioning the Sri Lankan delights of Apollo Banana Leaf on twitter I was intrigued. A bit of digging turned up glowing reviews, including from Chris Pople at ‘Cheese and Biscuits’. My interest suitably piqued I popped down the road and stumbled across one of the best meals of the year so far. Apollo Banana Leaf is just south of Tooting Broadway, near St. Georges Hospital. It’s not much to look at from the outside and the inside follows suit. You’re not here for the interior design – you’re here for the food. Our meal started with some delicious mutton rolls – crisp, fragrant and freshly fried. Alongside were some gorgeous green banana bhajis served with the kind of tomato-chilli sauce that dreams are made of – searingly hot while still maintaining a semblance of balance. Next up came some lovely sweet coconut rice, wonderfully spiced devilled mutton and some incredible fried prawns. So often seafood in Asian restaurants is fried and boiled to the point where it could be used to re-sole shoes – not here, tender and crunchy perfection. For me the real star was a ‘shock’ vegetarian dish: the aubergine masala – a delicate, mild curry sauce, packed full of texture and with a wonderful depth of flavour. On the surface it looks (and costs) the same as any other ‘Indian’ restaurant in South London. But the comparisons stop there – it serves magnificent Sri Lankan food with a precision and balance that I’ve not found anywhere else. It’s BYOB so you can grab something tasty from the cellar and eat yourself into a happy coma for under £15 a head. An absolute gem. A London summer can be a fleeting thing – a couple of weekends of gorgeous sunshine before the leaves turn and the familiar cold drizzle returns. What better way to spend one of these precious sunny days than in Regents Park with Britain’s finest chefs? Taste of London, now in its 11th year, brings together over forty top restaurants for a celebration of anything and everything to do with food. Alongside the main stalls there are plenty of bars, shops and smaller producers all touting their wares. After paying for entry to this culinary eden there are plenty of free samples – but to actually get your hands on the restaurant grub requires ‘crowns’, the festival currency. Each is worth a pound, but since you can’t turn them back into sterling, it’s worth planning your meal choices carefully. Over two days I sampled a decent amount of the food on offer. A charity collaboration between James Knappet (Bubbledogs), Brett Graham (The Ledbury), Anna Hansen (The Modern Pantry), Mark Hix and Tom Parker-Bowles – this is no ordinary hot dog. Top quality British pork sausage in a brioche style bun with smokey tomato and tamarind relish, piccalilli, scrumpy cider sauce and pork crackling. All to raise money for the marvellous Action Against Hunger – properly tasty. This is a searingly hot lamb curry from Goa, made with over twenty ingredients. It was rich, elegantly spiced and very tasty. I also liked that they included a decent portion of rice. I adore the desserts at Barbecoa, their calvados panna cotta has become a dinner party staple for me. This was a wonderfully rich panna cotta with a lovely champagne foam. So good that it got eaten before a photo could be taken…. Crispy soft shell crab on a roll, served with cucumber-mint salad, fresh lime and harissa mayonnaise. If that combination doesn’t excite you then I don’t know what will. The crab was red-hot, fresh from the fire on a fantastic roll and garnished with a lovely crisp salad. It had fantastic contrast: hot-cold, spicy-mild, and crunchy-soft. One of the best dishes I ate. On Sunday afternoon – much like at the Chelsea Flower Show – the top dishes of the festival are given rosettes, this was judged the best in the festival. A very generous slab of foie gras, crisped and cooked to perfection, served in a thin crunchy roti. It was wonderfully rich and decadent. One of the chef favourites – this is exactly what it says. Chicken necks, gently fried and doused in a lovely chilli rub. They’re quite difficult to eat (given the hordes of tiny bones) but the meat is richly flavoured and the spicing fantastic. Fall apart beef in a rich, savoury sauce on a pile of cheese – what’s not to like? The polenta was a revelation – incredibly smooth and with a real cheesy hit. I love char siu bao and this is very much a tribute to the great David Chang’s. Fluffy steamed clamshell style buns filled with tender pork and lovely dressings. I’ve never considered serving a fish bun like this but it was absolutely gorgeous. The kimchi was really restrained, which suited the fish. Spiral cut steak, marinated for 48 hours in garlic, parsley, aji molido and olive oil, served with humita stuffed baby red peppers. Gaucho have a good reputation, but I wasn’t impressed by this steak. The marinade was almost non-existent and there wasn’t the kind of outside char I’d expect from a steakhouse. I got to sample a bite of the Barbecoa steak and it was much better. The maize filled pepper was just okay as the filling was far too sweet. Very similar to the offering at duck and waffle – slow cooked cheeks with heavenly polenta. The whisky went really well with the rich pork, definitely a combination I’m stealing. Michel Roux Jr was on the stand all weekend which was a really nice touch, like a lot of the chefs he was happy to chat to fans and pose for photos. One of the better portion sizes, a mound of hot fresh squid, nicely crisped and well-seasoned. I’ve been desperate to go to Salt Yard for a while and after this burger I’m very keen. Rich, moist and beautifully put together. The pickled chillies were just delicious, cutting through the sweetness of the meats. Valrhona Macae ‘Pure Brazil’ dark chocolate ganache, coffee mousse, tonka bean ice cream – served with caramelized macadamia and lemon sorrel. This was easily the best dessert of the day – beautifully balanced chocolate and coffee with lots of lovely textures worked through it, beautifully presented and reasonably priced. Welsh lamb cutlets, ginger, mint, crushed peppercorns and a summer salad. While the lamb was obviously good quality, it had been rather overcooked, not even a hint of pinkness inside. The spice mix was nice, but the salad felt like a bit of an afterthought. Freshly fried and fabulously fishy – these are some of the best fishcakes I’ve had. A traditional Vietnamese dish of warm French baguette, thinly sliced pork shoulder, pickled carrots and daikon, drizzled in a chilli and cilantro dressing. It was a lovely sandwich, but the chilli dressing brought it to life – hot, sharp and very moreish. I could have sat there all day mopping up the last remnants with the French bread. This was a combination of their other three dishes – Scallop Shui Mai, Venison Puff and Wild Mushroom Dumpling. The scallop was beautifully presented and utterly delicious – fresh, well cooked and delicately spiced. I’ve never seen puff pastry used in dim sum but it really worked – the venison was wonderfully rich and tender. I was also impressed by the wild mushroom dumpling – rich and savoury without being too earthy. I ate some fantastic food – the po’ boy and sushisamba dessert particularly stand out – but for me, the highlight was seeing the chefs at work. 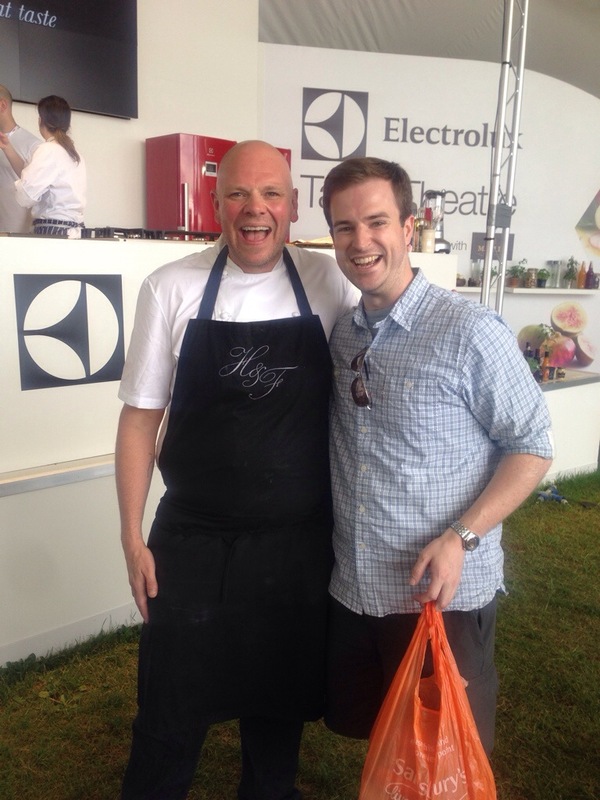 I got to fulfil a lifelong ambition of hugging Tom Kerridge and see him do wonderful things with squab pigeon, turnip and orange. Ashley Palmer-Watts broke out the Big Green Egg and cooked some superb looking lamb while Gizzi Erskine introduced hordes of people to the wonder of Korean food. I certainly picked up plenty of ideas and will definitely be slow cooking some cheeks with cheesy polenta this autumn. I also saw several people cooking with watermelon – expect to see that popping up on menus everywhere soon. Taste of London is a wonderful day out – yes it is expensive, but good food so often is. The chance to try a huge range of dishes, chat to people who are incredibly passionate about food and drink an awful lot of cocktails in the sun can’t be missed. While I’d have liked some slightly cheaper prices and bigger portions – I definitely wasn’t hungry at the end! It’s very well organised and I loved that you could by Voss water everywhere for a pound a bottle. If the line-up is as good next year – I’ll definitely be heading down. There can be few more beautiful sights than Cambridge in the sun. It’s the stuff of postcards and paintings – lazy river and soaring spires. For me, one of the real landmarks is Fitzbillies – a Cambridge institution that has been churning out the finest baked goods for generations. Their chelsea buns are the stuff of legend – rich, gooey and loved around the world – you can have them shipped almost anywhere. When, in early 2011, they were threatened with closure – food writer Tim Hayward came to the rescue. He kept the iconic buns, but transformed the back of the cafe into an occasional restaurant. The room itself is refreshingly light and simple – lovely pale wood and pastel tiles. Compared to the distressed brickwork and filament bulbs that seem to be infecting every restaurant in the capital, it’s a refreshing change. The menu is equally reassuring – tempting produce, simply cooked. To start I had an excellent grilled quail and aioli. Smokey, sweet and with just a hint of game it was delicious. Next up was beef tagliata – a lovely rump steak cooked to a perfect medium-rare and served on a bed of peppery rocket and hard italian cheese. It comes with a salsa verde and a pile of roast potatoes that would make any grandmother proud – crisp fluffy perfection. To finish I demolished an apple crumble tart with clotted cream. As you’d expect, from what is still essentially a bakery/cafe, the pastry was superb. I had a fantastic evening – the staff are helpful and suspiciously happy, the food is marvellous and on a Friday evening there was a healthy convivial buzz. I applaud the simplicity – there’s are no fancy sauces, powders, foams or gels. No ‘influences’ butting in and distracting from the elegance of the dish. It’s the very best kind of comfort food and left me smiling all the way home.